“Wow, I never saw that coming.” Just when I thought I was figuring things out, a plot twist hit me – not once, but over and over. Deliberate Deception is an apt title. Joe Porrazzo knows how to draw the reader into the story and never let go until the last page. Even then, questions arise to pique one’s interest for the forthcoming third book in the Alex Porter Trilogy. The author stirs politics, crime, greed, and love into the pot and delivers a good read. Good versus evil seems a clear concept until it becomes muddied. Porrazzo gives us an outstanding portrayal of one man’s reaction to morality, immorality, and amorality. Can the lines really blur, or is a clear-cut answer always the right one? Can love flourish amid deception? Can the sins of the past be forgiven? Alex Porter wrestles with these questions as he races against the clock to stop an unknown killer from an unspecified crime. The action in Deliberate Deception is non-stop, the dialogue is crisp, and the characters are realistic. It’s the kind of story that leaves the reader wondering what he would have done. Following the award-winning mystery thriller, SOLEMNLY SWEAR...Alex Porter is back…and the stakes just got higher! Things are heating up in Tucson, Arizona. A greedy corporation rigs a multi-million dollar raffle creating false hopes for ticket buyers. They're not winning, they’re dying! What comes next will shock the world! 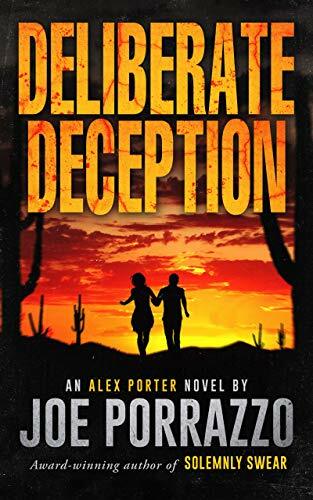 DELIBERATE DECEPTION heralds the return of Alex Porter; retired United States Air Force OSI agent turned private investigator, in another heart-pounding Joe Porrazzo suspense thriller. Seven months after leaving New England, Alex, still grieving the tragic deaths of his wife and daughter, gets a call from his friend Joe Prater. Prater’s old army buddy has gone missing from his home in Tucson, and Joe wants Alex to check it out. While investigating, Alex gets too close to the truth and finds himself caught in the deadly crosshairs. He finds himself teamed with the very person hired to kill him as they race against the clock to prevent a mysterious group from striking in Tucson and shocking the world. Don’t miss the nonstop action. The deception is deliberate. The results are deadly.